So I was able to pick up my package today, although it was a little smaller than I imagined. Then again, I don’t think I’ve ever replaced a harddrive in a laptop before, so the fact that this was considerably smaller than what I’m used to when thinking about “harddrives” probably had something to do with it. Also, by the time I got to the office, I had received an e-mail from my boss with the license keys I had requested. The upgrade is on for this weekend! When I left the office today, I made sure to make a print-out of the license keys and take the installation DVDs/CDs with me home, just in case I had the time and the urge to perform the upgrade already today. Needless to say, I never got the time to do something about it today. I did, however, do a test disassembly of my laptop after I got home, just to get a complete overview of where the components were located, and what screws to unscrew when the time finally comes (and, of course, to be even more sure that I had the right components and equipment to get through the upgrade). Then again, I was able to perform a backup of all the games and software I can’t get anywhere else before I went to bed, just to be even more prepared. I’m looking even more forward to get started on Saturday. Last week, I decided to go through with upgrading my laptop. The laptop is a 3 years old Dell Studio 1535, with 250 GB hard drive space and 3 GB RAM. After some research, I found that it currently has two RAM modules installed (one 2 GB and one 1 GB), and supports a maximum of 4 GB, meaning, I’ll be replacing the 1 GB module with a 2 GB one, maxing out what the laptop can handle. 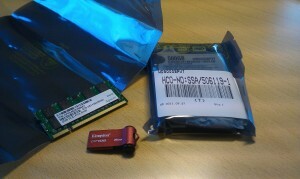 I also went with a new 500 GB hard drive, doubling the total capacity it can handle. Last, but not least, I threw in a 8 GB USB memory stick for good measure. It will come in handy when transferring somewhat large amount of data. Meaning, the package is ready to be picked up tomorrow. And since I just found out that the downtown post office had spent the last few days moving to another location, which would become just a few minutes away from where I work, it won’t even be a detour during my lunch break. I might even get brand new software for my upgrade from my workplace, too. Today, the laptop has Windows Vista Ultimate and Microsoft Office 2007 Ultimate, amongst other things, and through my office, I have access to Windows 7 and Microsoft Office 2010. I just have to ask my boss for the license keys, and it looks like I’ll go for the Windows 7 Professional and Office Professional Plus 2010 editions, since our company’s subscription package includes more than one license for these two. Our company only has one single license for the Ultimate edition of Windows 7, and I don’t want to be the one hogging this particular one. Besides, the differences between “Professional” and “Ultimate” aren’t that much of a deal anyway. If I get the license keys secured before the weekend, I’ll be spending the weekend upgrading and reinstalling software, and start next week with a renewed laptop. I’ll keep you updated on my progress. Or, at least somewhat, since my laptop won’t exactly be online while I’m doing this. Posted in blog | Comments Off on Almost upgrade time! I've censored out the identifying parts of the address to protect the innocent. I had an interesting piece of mail land in my mailbox earlier today (Friday). I’ve scanned it for your viewing pleasure. I don’t know how much you can actually tell from the scanned envelope, but it’s a letter that was returned to the sender (me). I instantly recognized what it was, considering the odd format of the envelope, but I began to wonder why the hell this was arriving in my mail now. You see, I recognized it as one of the Christmas cards I sent out to friends and associates, and as I examined the date stamped on top of the postage stamps to confirm, it was indeed sent at the beginning of December last year. The perceptive of you will also notice that the date printed on the “return to sender” label at the bottom of the envelope is August 22. This year. Since it was posted and stamped December 3, it took the various postal services exactly nine months from the time I sent the letter to the time it was returned back to me. About eight and a half of these months was apparently spent figuring out that the destination address didn’t exist. Letters and post cards between Norway and the United States usually takes one or two weeks, or up to a full month if you’re unlucky. What boggles my mind is, what kind of postal limbo has this Christmas card been in for the last 8 months? Has some joker had it on their desk for their own amusement? Did the P.O. box facility drop it under some piece of furniture, and found it during a more extensive office cleaning? I guess I will never know. And the person I tried to send this to received one less Christmas card last year. As a side note, I’d like to explain the three postage stamps attached to the envelope; the one on the far right is a non-denominated postage stamp (“valørløst frimerke”). This type of stamp was introduced by the Norwegian postal service in 2005, and is comparable to so-called “forever stamps” in the U.S. 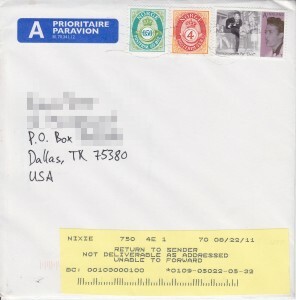 The design used on the stamp on this particular envelope is from a series of Norwegian rock pioneers (this one is about Per “Elvis” Granberg – a Norwegian artist who lived from 1941-1980 and was heavily influenced by Elvis Presley). The other two stamps (green and red/orange) have been added for additional postage to the U.S. (that is, in addition to the value of the “forever stamp”). In any case, and to repeat myself, I’m about as baffled as you are as to why it was returned to me now. Posted in blog | Comments Off on How late is late? Granted, they probably wanted to align all their branding with their Swedish-Finnish parent company, TeliaSonera, but by doing something like this, to me, seems like an illogical choice. You’re basically removing the separate identity of a company and a brand, and you’re forced to start more or less from scratch when it comes to building a brand identity with your would-be customers. I still don’t understand the need to spend a lot of dough to rebrand something that’s already doing well, both financially and brand-wise. I’ve covered this before when Telenor changed their logo. In time, I’ve managed to get used to Telenor’s new logo, but it took a few years before I did. Back in September 2008, the Norwegian postal service, Posten, defined their existing portfolio more clearly in their consumer-oriented segment, Posten, and their business-oriented service segment, Bring, and brought along a whole new brand design shortly after this change. From the traditional post horn to.... two concentric circles? They claim the new logos represent a modernized design of the post horn, but I have to look very closely to see this, even on a minor level. And in April and May 2009, the Norwegian oil giant Statoil wanted to jump on the rebranding bandwagon as well, for no apparent reason at all. From the famous oil drop to.... arts and crafts? They, too, got a lot of criticism for the new logo, in particular because this new logo resembled the logo for the Norwegian Folk Art and Craft Association (Norsk Husflidslag) too closely. You can probably see why. In a presentation accompanying the change at the time, claimed “it’s a star, a guiding star for a corporation that aims to be a pathfinder in oil, gas, and other forms of energy” (translated from Norwegian). I still don’t see their new design as something energy-related, though. All of these companies have something in common: they were already quite successful companies and brands prior to the logo changes, and that includes Telenor, which I had mentioned earlier. Rebranding costs money, from the actual designers, to several design suggestions (and actual design selection), all the way to removing the old logos and replacing them with the new logos on all stores, clothing, vehicles, signs, products and packaging, ads and commercials (including existing sponsorship signs and clothes), paper and envelopes, and everything else. And when you’re a large corporation with a few thousand stores and/or employees around the country and/or globe, this is far from cheap. I can sort of understand if they gradually choose to modernize their existing logo, but not when they choose to replace it altogether. I understand it even less when they change it to something that seems rather generic. To all other companies out there thinking about changing your logo, I have a simple advice: Don’t. Instead, consider to slightly modernize your existing logo, so that it does seem fresher, but also in a way that it’s still recognizable to those who were your customers 10 or 20 years ago (if your company is that old). And when you do, don’t rush the logo out everywhere; replace the logo on signs and other stuff out there when it’s natural to replace them (ie. when they start to show signs of wear and tear). You know who has actually been able to do that? Coca-Cola. They’ve been around for over 125 years, and have gone through over 10 design changes, each one resembling the previous one somewhat. And Coca-Cola’s logo today is quite similar to the original logo that John Pemberton’s partner Frank Mason Robinson created back in 1885. In other words, you don’t have to rebrand yourself to stay successful. Just focus all that money on something else, like improving your products, services or even your customer service instead.